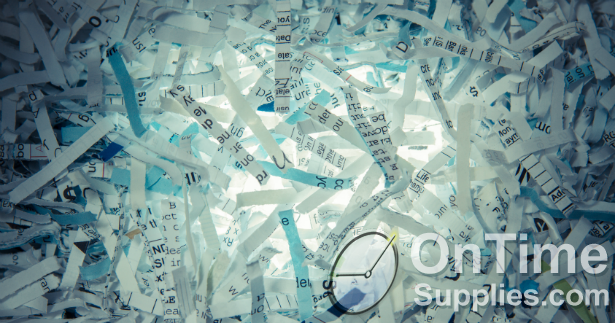 Reduce Clutter with Daily, Monthly & Quarterly Paper Shredding. Do your file cabinets runneth over? Can’t see your desk for all the paperwork clutter? We’ve discussed some methods of file organization before — Smead’s color coding system changed my life! — but we haven’t talked about the #1 culprit in messy: too much stuff. Reluctant to trash files and documents? That reluctance is standing between you and an organized office. I just came across this great LifeHacker tip on reducing paper clutter in your office: regularly scheduled one on one time with your paper shredder. Daily, monthly and quarterly paper shredding will clear some serious clutter and free up file cabinet space. Go through your mail and inbox daily, your files monthly and quarterly, and run the documents you don’t need through the paper shredder Mail, bills, pay stubs, credit card statements — all candidates for the paper shredder. And be sure to shred old document, not just toss them in the trash. Neglecting to shred your documents is like the #1 way to become a victim of identity theft. I like the idea of always having to a designated time to shred your paper. You will be more organized in doing so. Although you will waste time, it will pay off in the long run. Thanks for the read. It&apos;s a really helpful system to keep secret or destruct any information by shredding. Today&apos;s world has many technology and measure to secure data. Shredding company protects from identity theft and safely destroys personal information of customers or employees for which you are responsible.